How the Eye Works. The eye works like a camera. Light rays enter it through the adjustable iris and are focused by the lens onto the retina, a thin light-sensitive layer which corresponds to the film of the camera. The retina converts the light rays into nerve impulses, which are relayed to the visual center. There the brain interprets them as images. Like a camera lens, the lens of the eye reverses images as it focuses them. The images on the retina are upside down and they are “flipped over” in the visual center. In a psychology experiment, a number of volunteers wore glasses that inverted everything. After 8 days, their visual centers adjusted to this new situation, and when they took off the glasses, the world looked upside down until their brain centers readjusted. The retina is made up of millions of tiny nerve cells that contain specialized chemicals that are sensitive to light. There are two varieties of these nerve cells, rods and cones. Between them they cover the full range of the eye's adaptation to light. The cones are sensitive in bright light, and the rods in dim light. At twilight, as the light fades, the cones stop operating and the rods go into action. The momentary blindness experienced on going from bright to dim light, or from dim to bright, is the pause needed for the other set of nerve cells to take over. The rods are spread toward the edges of the retina, so that vision in dim light is general but not very sharp or clear. The cones are clustered thickly in the center of the retina, in the fovea centralis. When the eyes are turned and focused on the object to be seen the image is brought to the central area of the retina. In very dim light, on the other hand, an object is seen more clearly if it is not looked at directly, because then its image falls on an area where the rods are thicker. Color Vision. Color vision is a function of the cones. The most widely accepted theory is that there are three types of cones, each containing chemicals that respond to one of the three primary colors (red, green, and violet). White light stimulates all three sets of cones; any other color stimulates only one or two sets. The brain can then interpret the impulses from these cones as various colors. Man's color vision is amazingly delicate; a trained expert can distinguish among as many as 300,000 different hues. Color vision deficiency (popularly called “color blindness”) is the result of a disorder of one or more sets of cones. The great majority of people with some degree of deficiency lack either red or green cones, and cannot distinguish between those two colors. Complete color vision deficiency (monochromatic vision), in which none of the sets of color cones works, is very rare. Most deficiencies of color vision are inherited, usually by male children through their mothers from a grandfather with the condition. Stereoscopic Vision. Stereoscopic vision, or vision in depth, is caused by the way the eyes are placed. Each eye has a slightly different field of vision. The two images are superimposed on one another, but because of the distance between the eyes, the image from each eye goes slightly around its side of the object. From the differences between the images and from other indicators such as the position of the eye muscles when the eyes are focused on the object, the brain can determine the distance of the object. Stereoscopic vision works best on nearby objects. As the distance increases, the difference between the left-eyed and the right-eyed views becomes less, and the brain must depend on other factors to determine distance. Among these are the relative size of the object, its color and clearness, and the receding lines of perspective. These factors may fool the eye; for example, in clear mountain air distant objects may seem to be very close. This is because their sharpness and color are not dulled by the atmosphere as much as they would be in more familiar settings. Impaired Vision. This may consist of loss of visual acuity, visual field, ability to distinguish colors, motion of the eye, or any other function related to sight. (See also blindness.) Farsightedness, or hyperopia, results when the eyeball is shorter than normal and the image focuses behind the retina. Nearsightedness, or myopia, results when the eyeball is longer than usual from front to back, so that the image focuses in front of the retina. astigmatism is impaired vision caused by irregularities in the curvature of the cornea or lens. Patient Care. Visually handicapped persons who are visiting a clinic for the first time or being admitted to a hospital room require orientation to their environment. Ambulatory patients can be walked around to familiarize them with the location of the bathroom and any other facility they may need to use. Patients who are in bed following surgery or for therapeutic rest should have articles on their bedside table arranged in the same way all of the time so that they can be found easily. If only one eye is affected, articles should be placed within reach on the unaffected side and persons communicating with the patient also should stand on that side. If peripheral vision is limited, objects and persons should be positioned in the patient's line of vision. Some patients, especially the elderly, may experience increased sensitivity to glare. Wearing sunglasses outdoors, adjusting the window blinds to deflect the sun, and using indirect lighting can help avoid discomfort. This does not mean that the patient should be in a darkened room. For most, increased illumination makes it easier to see. It is the glare that impairs their vision. Patients with impaired vision may also benefit from such low-vision aids as convex or magnifying lenses that are hand held or mounted on a stand or clipped to the eyeglasses. Adjustable lamps, large-print reading matter, reading stands, writing guides and lined paper, and felt-tipped pens can facilitate reading and writing and improve the quality of life of a person with limited vision. Categories of nursing diagnoses associated with impaired vision include Anxiety, Ineffective Coping Patterns, Fear of Total Blindness, Impaired Home Maintenance Management, Potential for Physical Injury, Impaired Physical Mobility, Self-Care Deficit, and Self-Imposed Social Isolation. Top, Anatomy of the eye. Vision is the reception of images by the eye as a result of the passage of light into the eye. Light is focused by the lens on the retina, where it is converted into nerve impulses that are transmitted to the centers in the brain where images are interpreted. anomalous trichromatic vision color vision deficiency in which a person has all three cone pigments but one is deficient or anomalous; it may be either inherited as an X-linked recessive trait or acquired as a result of a retinal, cerebral, systemic, or toxic disorder. binocular vision the use of both eyes together, without diplopia. central vision that produced by stimulation of receptors in the fovea centralis. day vision visual perception in the daylight or under conditions of bright illumination. dichromatic vision color vision deficiency in which one of the three cone pigments is missing altogether. The most common forms are protanopia and deuteranopia, which are transmitted by X-linked inheritance. A third form, tritanopia, is very rare. A fourth form is also thought to exist, called tetartanopia. Called also dichromatism. low vision impairment of vision such that there is significant visual handicap but also significant usable residual vision; such impairment may involve visual acuity, visual fields, or ocular motility. monochromatic vision color vision deficiency in which the person cannot distinguish hues, so that all the colors of the spectrum appear as shades of gray. Popularly known as complete or total color blindness. monocular vision vision with one eye. night vision visual perception in the darkness of night or under conditions of reduced illumination. peripheral vision that produced by stimulation of receptors in the retina outside the macula lutea; called also indirect vision. 1. any ability to see all three primary colors of light (red, green, and blue). 2. normal color vision; called also trichromacy and trichromatism. 1. that in which the visual field is severely constricted. When it is due to organic causes, such as retinitis pigmentosa or glaucoma, the visual field expands as it is tested at increasing distance from a constant object but when it is due to psychogenic disorders, such as conversion disorder or malingering, the field remains constant or contracts as the distance increases. 2. in psychiatry, restriction of psychological or emotional perception to a limited range. 1. the sense by which objects in the external environment are perceived by means of the light they give off or reflect. 2. the act of seeing. 3. an apparition; a subjective sensation of seeing not elicited by actual visual stimuli. anomalous trichromatic vision defective color vision in which a person has all three cone pigments but one is deficient or anomalous but not absent. binocular vision the use of both eyes together without diplopia. central vision that produced by stimuli impinging directly on the macula retinae. 1. perception of the different colors making up the spectrum of visible light. dichromatic vision defective color vision in which one of the three cone pigments is missing; the two types are protanopia and deuteranopia. low vision impairment of vision such that there is significant visual handicap but also significant usable residual vision. monochromatic vision complete color blindness; inability to discriminate hues, all colors of the spectrum appearing as neutral grays with varying shades of light and dark. peripheral vision that produced by stimuli falling on areas of the retina distant from the macula. solid vision , stereoscopic vision perception of the relief of objects or of their depth; vision in which objects are perceived as having three dimensions. 1. any ability to distinguish the three primary colors of light and mixtures of them. 1. that in which the visual field is severely constricted. 1. The faculty of sight; eyesight. 2. The manner in which one sees or conceives of something. 1. The act of seeing. 2. Visual acuity. See Binocular vision, Computer vision, Tunnel vision. 1. The appreciation of differences in the external world, such as form, colour, position, etc. resulting from the stimulation of the retina by light. 2. See unaided visual acuity. alternating vision See contact lens. ambient vision Vision mediated primarily by the peripheral retina and involved in spatial orientation and recognition of motion. See focal vision. anomalous trichromatic vision See anomalous trichromatism. binocular vision (BV) Condition in which both eyes contribute towards producing a percept which may or may not be fused into a single impression. See sensory fusion; monoblepsia; critical period; bar reading test; FRIEND test; hole in the hand test; Worth's four dot test; Worth's classification of binocular vision; binocular vision single zone of clear. binocular single vision See single binocular vision. blurred vision Vision characterized by poor visual acuity or in which the edges of objects are indistinct. It may be due to uncorrected or poorly corrected ametropia or presbyopia, anomalies of the ocular media (e.g. cataract, corneal opacity, haemorrhage in the vitreous), amblyopia, excess lacrimation, spasm of accommodation, optic neuritis, angle-closure glaucoma, diabetes, multiple sclerosis, migraine, etc. central vision Vision of objects formed on the foveola or the macula. See sensory fusion. chromatic vision See colour vision. colour vision (CV) Vision in which the colour sense is experienced. Syn. chromatic vision. See Hering's of colour vision theory; Young-Helmholtz theory. daylight vision See photopic vision. defective colour vision See defective colour vision. distance vision (DV) Vision of objects situated either at infinity or more usually at some 5 or 6 m. See Snellen chart; near vision. diurnal vision See photopic vision. double v . See diplopia. eccentric v . See eccentric fixation; peripheral vision. entoptic v . See entoptic image. extrafoveal vision See peripheral vision. field of vision See visual field. focal vision Vision mediated by, primarily, the macular area of the retina and involved in the examination and identification of objects. See ambient vision. green v . See chromatopsia. gun barrel v . See tunnel vision. haploscopic vision Vision as obtained by looking in a haploscope. indirect vision See peripheral vision. industrial vision The branch of optometry concerned with vision and perception by the individual at work, the evaluation of visual performance in a given occupation, the prescribing of protective ocular devices and the determination of the optimum environment (e.g. illumination) to accomplish a visual task efficiently. intermediate vision Vision of objects situated beyond 40 cm from the eye but closer than, say, 1.5 m. See distance vision; near vision. island of vision A description of the visual field as a three-dimensional hill surrounded by a sea of darkness. Stimuli that fall within the island can be seen, whereas stimuli that fall outside the island cannot be seen. The height of the island represents the sensitivity of the eye, with the highest acuity at the top of the hill corresponding to foveal vision and declining progressively towards the periphery (when the eye is light-adapted). See visual field. low vision Vision impairment even after correction by conventional lenses, resulting from either congenital anomalies or ocular diseases such as cataract, glaucoma, age-related macular degeneration, pathological myopia, trachoma, onchocerciasis, etc. The correction and rehabilitation of patients with low vision is achieved by special aids called low vision aids (LVA) such as a telescopic lens, and appropriate counselling (e.g. about illumination and reading distance). The criteria that the health authorities normally use to classify a person as having partial sight take into consideration not only the corrected visual acuity but also the extent of visual field loss (generally less than 20º). Syn. partial sight; subnormal vision.The World Health Organization (WHO) defines low vision as visual acuity less than 6/8 (20/60) and equal to or better than 3/60 (10/200) in the better eye with best correction. See low vision aids; blindness; bracketing; Bailey-Lovie chart; contrast sensitivity chart; clipover; deaf-blind; halogen lamp; cross-cylinder lens; telescopic lens; apparent magnification; relative distance magnification; relative size magnification; magnifier; Kestenbaum's rule; magnifying spectacles; pinhole spectacles; galilean telescope; Pepper test; typoscope; eccentric viewing. mesopic vision Vision at intermediate levels between photopic and scotopic vision, and corresponding to luminances ranging from about 10−3 to 10 cd/m2. Syn. twilight vision. monochromatic vision Synonym of monochro-matism. See monochromat. monocular vision Vision of one eye only. near vision (NV) Vision of objects situated 25-50 cm from either the eye, or more commonly the spectacle plane. See Jaeger test types; distance vision. night vision; nocturnal vision See scotopic vision. panoramic vision Vision of some animals whose eyes are located laterally so that the two visual fields overlap only slightly or are adjacent, thus providing vision over a much larger region of the environment than if the two lines of sight were aimed in the same direction. peripheral vision Vision resulting from stimulation of the retina outside the fovea or macula. Syn. eccentric vision; extrafoveal vision; indirect vision. See sensory fusion; central vision. photopic vision Vision at high levels of luminance (above 10 cd/m2) and resulting from the functioning of the cones. Syn. daylight vision; diurnal vision. See duplicity theory; differential threshold. vision science The scientific study of how the visual system contributes to an understanding of the environment by processing and interpreting the light stimulation to the eye. Various disciplines contribute to vision science including anatomy, biology, optics, physiology and psychology. scotopic vision Vision at low levels of luminance, below about 10−3 cd/m2 and resulting from the functioning of the rods. Syn. night vision; nocturnal vision; scotopia. See duplicity theory. vision screener An instrument used to measure various visual functions rapidly and inexpensively. There are various models, but most are modified stereoscopes with an internally illuminated set of targets and an optical system or variable target positioning to simulate either a near or far testing distance. Most of these instruments measure visual acuity, heterophoria, fusion, stereopsis, colour vision and visual field. See photorefraction. simultaneous vision See contact lens. single binocular vision (SBV) Condition in which both eyes contribute towards producing a single fused percept. See sensory fusion. spatial vision See depth perception. subnormal vision See low vision. telescopic vision See tunnel vision. vision therapy; vision training See visual training. tunnel vision Vision limited to the central part of the visual field as though one were looking through a hollow tube. It may be a symptom of hysteria, malingering, the final stage of either open-angle glaucoma or retinitis pigmentosa, etc. Syn. gun barrel vision; telescopic vision. See hysterical amblyopia; visual expander field. twilight vision See mesopic vision. 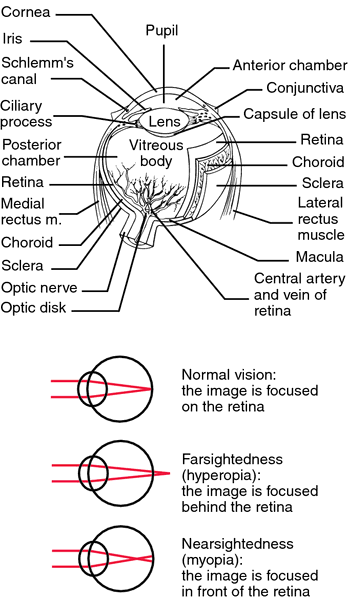 Worth's classification of binocular vision For the purpose of visual rehabilitation, binocular vision is often classified into three grades: (1) simultaneous binocular vision (first-degree fusion or superimposition); (2) fusion (sensory fusion or second-degree fusion or flat fusion); (3) stereopsis (third-degree fusion). See sensory fusion; superimposition. n sight; the faculty of seeing. n the portion of space that the fixed eye can see. 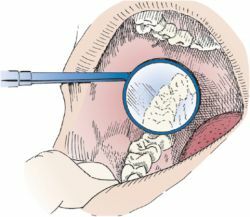 n 1. in dentistry, the capacity to see the treatment area by using a oral cavity mirror. n vision in which the visual fields of the two eyes are unified. Sensations from a common object received by the two eyes are superimposed, and as a result of the slight differences in the fields and the superimposition of the fields, the effects of depth and shape of the object are attained. the faculty of seeing; sight. The basic components of vision are the eye itself, the visual center in the brain, and the optic nerve, which connects the two. Abnormalities of vision in animals can only be inferred by an assessment of the animal's response to a variety of visual stimuli. The commonly used tests of vision are the menace reflex test, the watching of a moving object and the obstacle test. These can all be performed in subdued light as a test for night blindness. vision characterized by lack of color vision. the use of both eyes together, without diplopia. that produced by stimulation of receptors in the fovea centralis. visual perception in the daylight or under conditions of bright illumination. visual perception in the darkness of night or under conditions of reduced illumination. 360° vision conferred on grazing herbivora by the lateral placement of their eyes. that produced by stimulation of receptors in the retina outside the macula lutea.